On September 20th, 45 people in high spirits despite the early hour and high winds, all wearing matching green t-shirts, enthusiastically gathered at Oak Street Beach gazebo in Chicago. The group comprised a very special Adopt-a-Beach team: Beam Suntory. As an international liquor and spirits brand, Beam Suntory brews and crafts “spirits that stir the world.” With distilleries and offices all over the world, the company makes an effort to connect with the communities they’re a part of, giving back to local charities that reflect company values. The Beam Suntory Chicago headquarters team decided there was no better way to give back to their community than to protect the water that borders it: Lake Michigan. 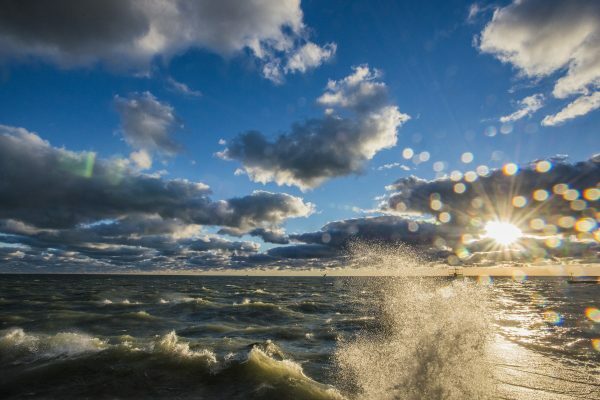 Water is integral to all of Beam Suntory’s products, so they connected with the Alliance for the Great Lakes to make sure the largest surface freshwater source in the world remains clean and healthy. 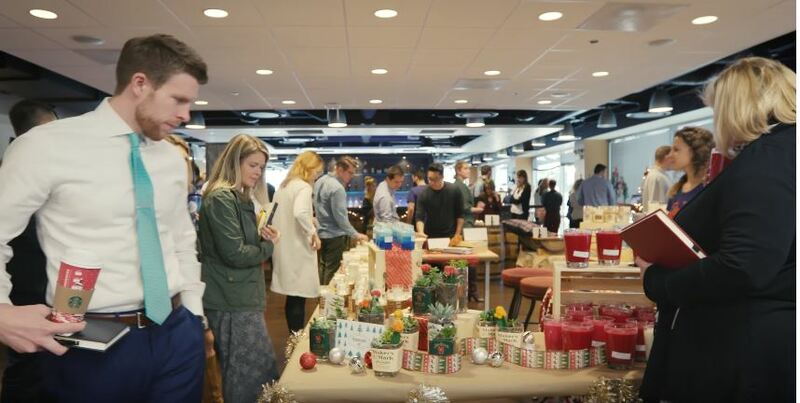 Beam Suntory first connected with the Alliance last year, when they chose the organization to be the beneficiary of their Holiday Bazaar fundraiser, a street-fair style market held at their Chicago location. It featured products created by Beam Suntory employees that related to cocktail culture and their different brands. The fair included all types of creative products such as posters, candles, ornaments, bourbon salted caramels, scotch pretzels, and more. Guests could attend the bazaar and purchase the creative treats or just enjoy a cocktail, browse, and admire the creations. Over the course of the holiday season, Beam Suntory Chicago staff raised nearly $35,000 for the Alliance. Beam Suntory chose the Alliance to be the beneficiary of this event after their executive team participated in an Adopt-a-Beach cleanup the summer before. Beam Suntory’s dedication to Great Lakes protection goes beyond raising and donating funds, to boots-on-the-ground involvement in Great Lakes protection. The interest in having a hands-on impact led them to the beach with the Alliance’s Adopt-a-Beach program. The September 20 cleanup marked the group’s third year picking up litter from Lake Michigan’s Chicago shoreline. At this year’s cleanup, 50 employees removed more than 80 pounds of litter from the Oak Street Beach. 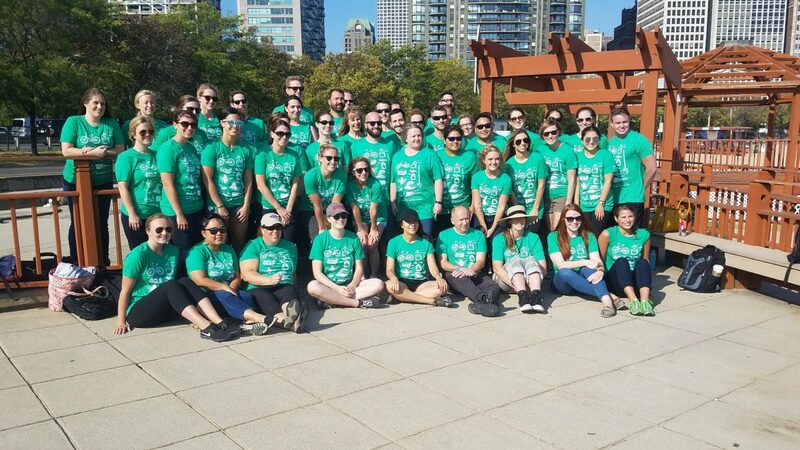 Nearly 50 Beam Suntory employees took to Oak Street Beach in matching “Growing for Good” t-shirts. Growing for Good is the company’s initiative to protect the resources that their products and community rely on. Protecting the Great Lakes is also in the best interest of the 40 million people who call it home, and we all have to work together to make it happen. The Alliance is grateful for the work of Beam Suntory and their dedication to the Great Lakes. If you or your business is interested in working with the Alliance, contact Megan Hilbrich, our Institutional Giving Manager.